Alisha Farrer is a successful model and actress of Indian origin. She was born and brought up in Perth, Australia to parents of Indian origin. Right from the age of four, she had been involved in acting and dancing considering her interest in these fields. She loved Bollywood movies especially the dance and songs in these films and got inspiration to make her career in this field. She created her own official portfolio seeking the help of a known fashion photographer called Praveen Bhatt in New Delhi, India.. This was in the year 2013, while in the very same year; she did an online web series called In the Hands of Todd. 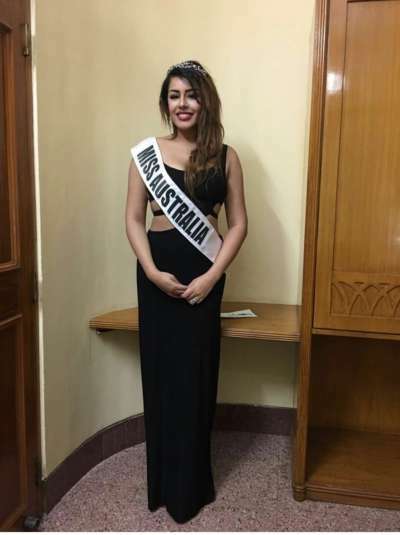 She contested in Miss India AU wherein she was among the finalist . She then was seen in the fashion show of Manish Malhotra in London. Presently she is a contestant of MTV Spitsvilla Season 10. 1. Whom do you consider your idol? For me my idol would have to be the one and only Aishwarya Rai Bachchan . I&apos;ve been watching her since a very young age and she has always inspired me. I have always loved everything about her, she has so much grace and perfection. From the way she dances, her finger movements, her body movements, the expression, there&apos;s a certain charm and vivacious attitude to her as well as the fact that she is so classy and so beautiful. She&apos;s an amazing actress and she is the definition of a "movie star". You will definitely find small traits of Aishwarya Rai in me as I have always observed her and incorporated things I love about her in myself. Katrina Kaif and Nargis Fakhri too inspired me since they both hailed from abroad and made their mark in Bollywood and that&apos;s something that I have been working towards. 2. When did you start modelling and tell us few highlights about your modelling career so far ? From the age of 4 I had shown interest in acting and dancing and was a fan of Bollywood films. I used to watch them all day everyday and copy the dance moves infront of the tv. I was so mesmerized by the colors, the fun, the expressions, the songs that I knew this is something that I wanted to do. My parents nurtured my interested and had me performing at events from the age of 6 onwards. I used to perform on stage at Indian events and weddings and would always receive excellent feedback. I attended Hampton Senior High School which has a specialized dance and drama project in which I learned Jazz, Tap, Ballet and Contemporary for 4 years. Ballet was always the hardest in the winters when I would have to get up at 5.30 and get to school in a tutu in the freezing cold. Having said that, my passion for dance was always so much that once I started I would forget everything and after graduating in 2010, my parents encouraged me to take up modelling. After I was signed with Perth&apos;s Top Agency, Scene Model Management my modelling career started to pick up as I was offered to model for clothing brands, television commercials for well known brands and runway shows. I walked the ramp for many events and designers such as Rocky Bay, Model of the Future, Fashion HEIR and Manish Malhotra in London. I was selected to represent Perth in Indian Australian Dancing Star, a finalist for Miss India Australia representing Perth, as well as a state finalist for Miss World Australia. In march 2012, I represented Australia in the Beauty Pageant Indian Princess International and I was placed top 5, and also won Miss Best Smile. The pageant grooming and training was broadcast internationally on Channel V including the grand finale. I was judged by Bollywood stars Hema Malini and Zeenat Aman. After visiting Mumbai I had been offered to pursue a career in acting however I felt that I was too young and inexperienced to be exposed to the industry and declined and continued to model in Australia. In January 2013 I briefly appeared in the short film "In the Hands of Todd". Shortly after in April, I had a small role in the Australian film, Son of a gun, starring Ewan McGregor shot in Perth. After that, I decided to take a years break from modelling to focus on my studies as I wanted to give more priority to my education and completing my teaching degree at Curtin University . With the support of my parents after a year i then decided to take a step closer to my dream and moved to Mumbai in August 2014. I Signed my first film within 3 days of arriviing, By 2015, I had completed adds in India for brands such as Renault and Sunsilk. 3. How did you feel on becoming Miss Australia? It was an amazing feeling, its a lot of hard work you have to put in but the result is unbelievable, you just have to believe in yourself and not take it too seriously, pageant life can be intense, so I just stayed focused and did my best and I managed to win the crown. I was so happy and after that life had just made my path for me, i just went with the flow. It still is unbelievable at times but I would not give up these moments for anything in the world, these experiences have taught me so much and shaped me into the woman I am today. You learn so much from pageants an you can implement them into your modelling career in the future. My family is super supportive, when i didn&apos;t have faith in myself my parents were the ones who told me to go forward and continue modelling, do pageants and move to India. A lot of parents don&apos;t support their child&apos;s career in this industry, but my parents do which is a blessing, so anything I do I keep them in mind. 5. What was the most memorable experience you had while on tour? Meeting new people, seeing different countries and learning about their cultures and traditions, it was such an amazing experience. 6. How is India treating you and what are your expectations from the country or the people of this country? India is great, its a hard place to live no doubt and it takes some getting used to but its a place that one you are here its very difficult to leave, the country has so much to offer and a majority of my best memories have been created in India. 7. How is your journey been in MTV SPLITSVILLA SEASON 10 ? My journey on Splitsvilla 10 was quite interesting. I never thought that I would do a reality show as I never watched them, especially Indian reality shows. When I was approached for splits I was a bit skeptical but I was convinced thoroughly to do the show and they were really really keen to have me on the show so I decided to do it. When I entered the villa I had no idea what to expect as I never watched the show but the bitching and the drama had started from day one so that was quite an alarm for me as I am a very down to earth and chilled out sort of person so I&apos;m not really into fighting for no reason. There was a lot of mean girl behavior and backstabbing going on but I was just in my own zone. I prefer to keep my peace of mind so I maintained distance from the other girls. I always believed that one should maintain their class and not be camera hungry, seeking attention and being fake. My personality is very calm and collected and that&apos;s how I like to be. I was mostly to myself and I hung around with two girls casually where we would just chill and not over think things. On the show I met Haneet, someone who I had met 3 years ago in Delhi and never expected to meet again, slowly on the show we got talking and we decided to form a connection, a mere friendship in which we would perform together and save each other if required. As time went on and I spent more and more time with Haneet, I started to like him and we began to fall for each other, our friendship turned into something more and we had found comfort in each other. We played and performed to the best of our ability. The best thing about him was performance wise he was a lot like me, he never took things too seriously in which in case there was a loss he would be in a "depression" like some of the other contestants. You must remember it&apos;s just a show so you should perform to the best of your ability and hope for the best, what&apos;s the point of going crazy and loosing your cool. We both never pressured each other, we kept each other motivated and most of all had fun! And that is seen through the show that we are chilling and having fun. After that near the end there was a lot of drama, which will be revealed near the end, as the game goes on the contestants were getting more and more savage in desperation to win they were doing all sorts of things. I played as well as I could and maintained my class till the end, I spoke when necessary and never did anything for the cameras, which worked well for my image as an actor. I had a good time and I found someone who is very special to me. Never in a million years would I ever think that I would date Haneet Narang. I felt on the initial meeting that we are too different, but now I can&apos;t imagine my life without him, after splits I wasn&apos;t sure if we would stay together or not but we have managed to for so many months and we plan to continue to do so. 8. What can you advice to those people who would like to be a model? My advice would be go for it. Modelling is a short lived career unless you make it big and become an icon so if you feel that you have the potential and this is something that you really want to do then go for it. Follow your dreams and don&apos;t let anyone stop you, however make sure that its something that you really want and if your taking a step into this career learn that its not just all glitz and glamour. there is a lot of struggle and a lot of hard work that will need to be put in, a lot of sacrifices and long hours where you will have to work harder then someone who does a 9-5 job. You need to be completely focused and not get carried away with the success that comes your way, stay grounded and stay focused.